Looking for a basic dance class that will teach you simple, practical moves as well as rhythm and coordination? 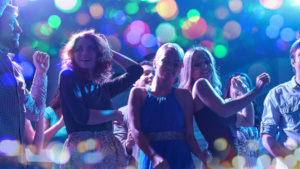 Our nightclub and party dancing classes are designed for absolute beginners with the aim to get you confident dancing in a social situation - the bar, the club, the party, the wedding etc. We have devised two types of courses focusing on solo dancing and dancing with a partner. Click on the options below to find out more and book your place on a course. A great way to see how you can develop skills dancing by yourself before committing to our progressive courses. Suitable absolute beginners to dance, you will cover leading and following principles, rhythm and basic steps and turns combined in sequences you can use on the dance floor straight away. A great way to try see if you enjoy dancing in sync with a partner.